The likelihood of cold, frosty, or freezing temperatures has been detailed -- see http://cdo.ncdc.noaa.gov/climatenormals/clim20supp1/states/NY.pdf -- for locations throughout the country. The closest weather station connected to that site around here is in Poughkeepsie, and in mid-May that site has a 50% chance of experiencing cold weather (36°F.) and a 10% chance of of experiencing frost (32°F.). Cold air, being heavier than warm air, sinks to low-lying spots on clear still nights, such as last night, so my garden in the Wallkill River valley is usually a few degrees colder than surrounding areas, such as Poughkeepsie. Fortunately, temperatures last night here dropped only to 31° F.
Not that lower temperatures would have done my vegetables or flowers any harm. I took the advice I’ve been doling out to others for the past couple of (warm) weeks, and held off planting anything that could be harmed by frost. So tomatoes, peppers, melons, and the like are still in pots that I moved into the warmth of the greenhouse last night. I’d like to plant out all these cold-tender seedlings but chilly temperatures are predicted for the next few night. Even chilly temperatures, let alone freezing temperatures, are not good for tender plants. kin, lettuce, onions, and other cold-hardy transplants that have been growing out in the garden for the past couple of weeks. I had some row cover material readily on hand, so why not, methought, throw it over some of the beds anyway? Just in case. Throwing covers over plants at 7 in the evening is a lot more pleasant than waking up at 3 am with the sinking feeling that temperatures have really plummeted and then, if they in fact did, running outdoors in the cold darkness to cover plants. 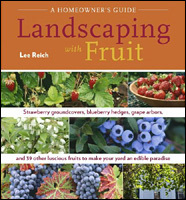 Fruit trees, shrubs, and vines present another story. A freeze won’t kill the plants, but low enough temperatures could kill flowers or developing fruit, as it did on many fruit plants last year. One frigid night and you have to wait a whole year for the next crop. Unfortunately, not much could be done about this situation. Fruit plants here are too many or too big to cover. My tack is to keep fingers crossed. Critical temperatures for fruit damage vary with the kind of fruit, the stage of flower or fruit development, the depth of cold, and the duration of cold. Probably other things, too, such as humidity and plant nutrition. An excellent table of “Critical Temperatures for Frost Damage on Fruit Trees” can be viewed at http://extension.usu.edu/files/publications/factsheet/pub__5191779.pdf. So, put simply, 25°F would spell death to 90% of my apples, which are in full bloom, and pears, which are post-bloom, and 28% would do in 10% of their fruits. 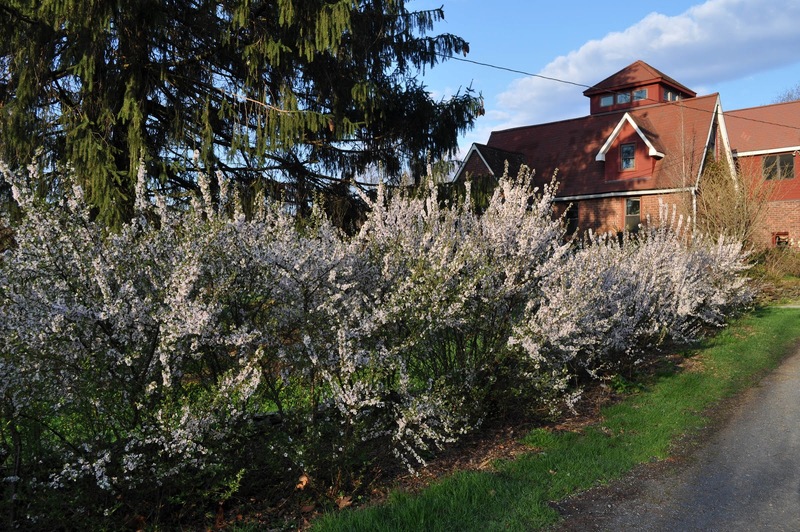 Plums, also post-bloom, tolerate a bit more cold. 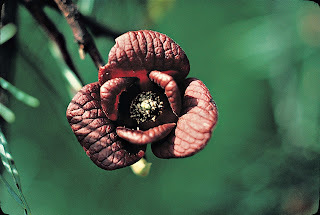 In addition to crossing fingers, my tack is also to grow a variety of fruits, and especially native fruits. 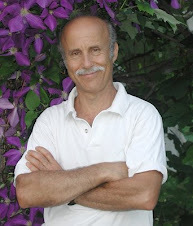 (Apples, pears, peaches, and most plums are not native.) It’s not a chauvinistic choice; it’s just that these natives -- American persimmon, pawpaw, blueberry, grape, and gooseberry, to name a few -- are better adapted to our conditions. And not just the weather here. Pests also. Update, May 17th: Warm days and nights that are not too chilly are predicted for the next few days, so I planted out tomatoes and peppers today. I’ll still keep an eye on temperatures because there’s still a 10% chance of temperatures dipping to 36° as late as May 28th according to records at the nearby Poughkeepsie weather monitoring station. 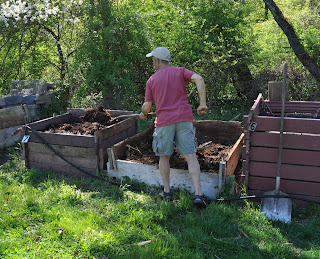 Here’s my compost routine: All summer and into autumn I fill empty compost bins with hay, wood shavings, horse manure, weeds, kitchen waste, and old garden plants along with some sprinklings of soil, limestone, soybean meal (if extra nitrogen is needed), and sufficient water to moisten the ingredients. When a bin is full, which means loaded up about 5 feet high, it gets covered with a sheet of EPDM rubber roofing material to keep excess moisture out and to seal in whatever moisture is within. A numbered label on each pile gets recorded to remind me when the pile was completed, what went in, and, with the help of a 2-foot-long thermometer, how much heat, if any, was generated. has fared over the past 10 months; some piles might still be a bit raw, others are just about finished and ready for use. No matter, I don’t need any compost yet. No rule that says compost piles have to be turned at all. I do it because I like to see what’s been going on and so I can make slight adjustments, as needed. Sometimes a little more water is needed. Turning the pile also gives me the opportunity to break up any clumps of material and render the finished pile more uniform. 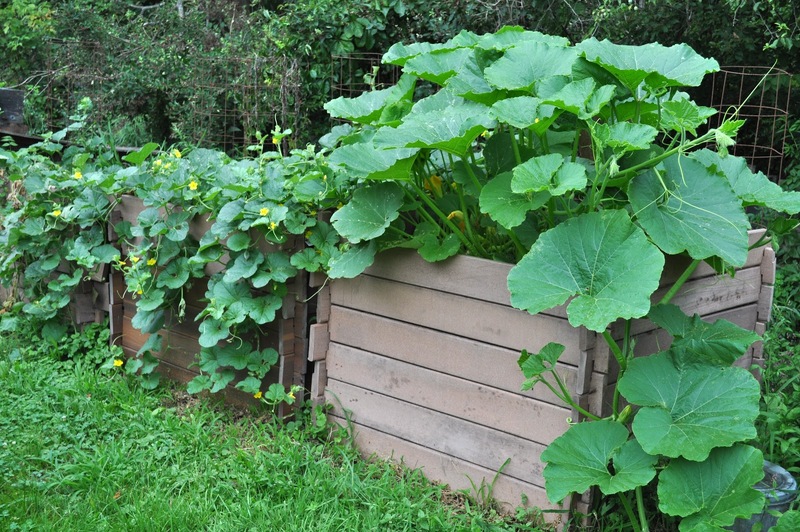 One more reason for turning and organizing all of last year’s compost piles is to make space for growing melons and squashes. 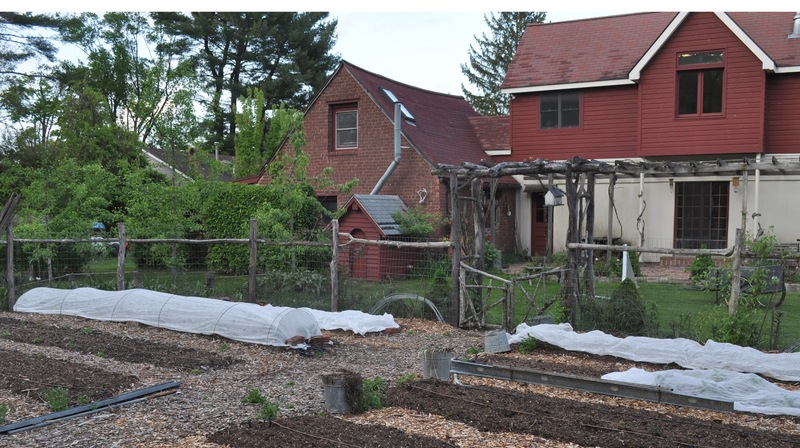 My vegetable garden is very intensively planted, with 3 foot wide beds packed tight with one or more vegetables growing together or in sequence, perhaps even trained skyward to get more out of the space. The long, sprawling vines of melons and squashes don’t fit into this scheme of things. The compost bins -- 4 foot by four foot by 3 to 4 foot high cubes -- are perfect for these vines. Three or 4 plants poked into the rich compost through holes made in the rubber roofing can sprawl to their hearts’ content, spreading out to cover the tops of the bins and then, if they like, draping down to the ground, even creeping along the ground if that’s their whim. Melons and squashes thrive in rich soil, and my plants roots couldn’t find themselves in a richer soil than the pure compost within the bins. Plenty of water is needed to plump up the fruits; the compost clings to enough water so that watering is hardly necessary. The only melon that does not get planted on a compost bin is watermelon. But even watermelon doesn’t go in the garden. It goes onto a pile of wood chips or leaves I had dumped here last autumn and winter. 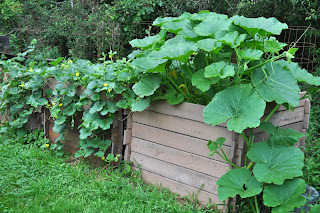 need to get into the compost bins before frost and short days; muskmelons, honeydews, and cantaloupes will be gone and out of the way but watermelon would not. Also, watermelons don’t demand a rich soil. “Soil” that’s either partially decomposed leaves or wood chips is poor in nutrients, to say the least. So poor that when I plant in the leaf or wood chip pile, I scoop out a generous hole and fill it with compost to get the plant off to a good start. During the growing season, I’ll occasionally dose the watermelon plants with some soluble fertilizer. All kinds of melons thrive in heat, in the air and in the ground. Freshly turned compost and old leaves or wood chips aren’t static. They are decomposing and, in doing so, generating some heat. All of which makes for good crops of good-tasting melons. 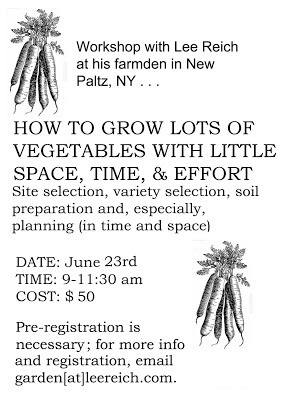 Okay, let me take a deep breath and resolve this not-living-in-the-present of gardening. It’s not really that bad. I figure out what has to be done -- a written schedule updated as necessary from previous seasons’ notes is crucial for this -- and and then immerse myself in the all-present of doing it. And it’s not all for end results; there’s the joy and satisfaction of watching plants grow and come into fruition and respond to my ministrations. temperatures that spur seeds -- and plant growth, for that matter -- awake are between about 30 and 45°F. That’s why yellowhorn seeds awoke back in February. Outdoors, the requisite number of hours in that temperature range might not have accumulated until around now. Sometimes -- usually -- it’s best to let Mother Nature do the planting. On a recent drive to West Virginia, where the spring season is about a week ahead of here, the mountainsides were awash in redbud bloom. But people love to complicate things. Hence, compost tea, biochar, and now, straw bale culture. A recent article in the New York Times about straw bale culture has everyone -- or at least the handful of people who told me of their plans for the season -- trying out this new and allegedly wonderful alternative to merely dropping seeds in the ground. 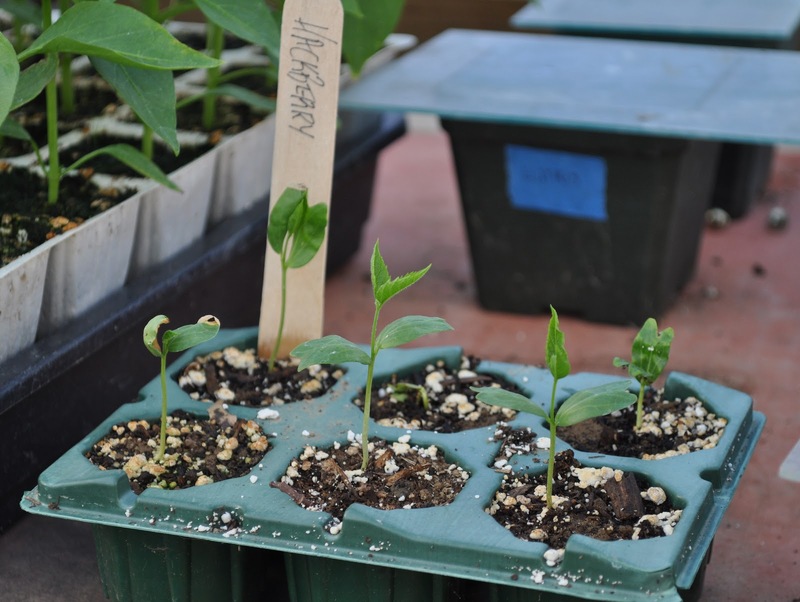 Named varieties are not available for every plant and, for some, pretty much all seedlings are quite good. The hedge of Nanking cherries along my driveway -- and now in bloom! -- are merely seedlings, but all the plants are beautiful and yield, in a couple of months, great quantities of tasty cherries with virtually no effort on my part. No varieties are available. Locust -- black locust, Robinia pseudoacacia, that is -- is a tree of many qualities. For starters, the roots can garner nitrogen from the air and put it into a form the tree can use, eventually putting it in the soil. 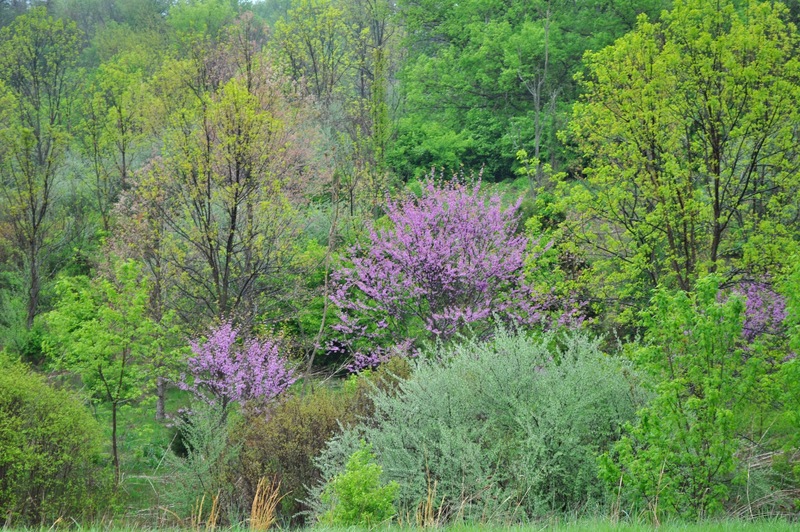 Black locust also laughs off heat, drought, air pollution, and road salt. The tree’s craggy branches and deeply furrowed bark are fondly reminiscent of those trees that hugged Dorothy on the yellow brick road to Oz. Towards the end of next month, chains of pale lavender blossoms will be dangling from the branches. More than just pretty, these flowers fill the air with a sweet aroma that carries far. What more could one ask from a tree? Wood! Some of which I was harvesting from my locust mini-grove last week. 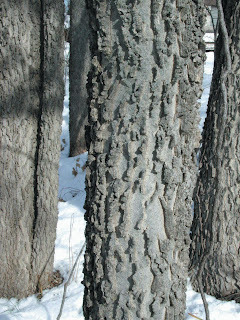 The grove is a stand of locusts of various ages popping up in a swathe about 15 feet wide by about 60 feet long. 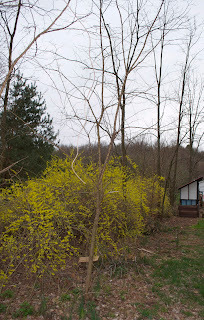 Forsythia shares that space as understory, new plants developing wherever canes arch to the ground to root. The locust grove formed naturally from a long-gone nearby grove on a neighbor’s property, felled by chainsaws, the new plants arising from dropped seeds as well as from root suckers. Locust is one of the best woods for burning, but cutting trees from my mini-grove for firewood would hardly be worth it. One week in winter would decimate the small patch. The locust I cut is destined for posts. Locust is one of the most rot-resistant woods, putting even cedar to shame. It can outlast pressure-treated wood, offering a nice rustic look to boot. 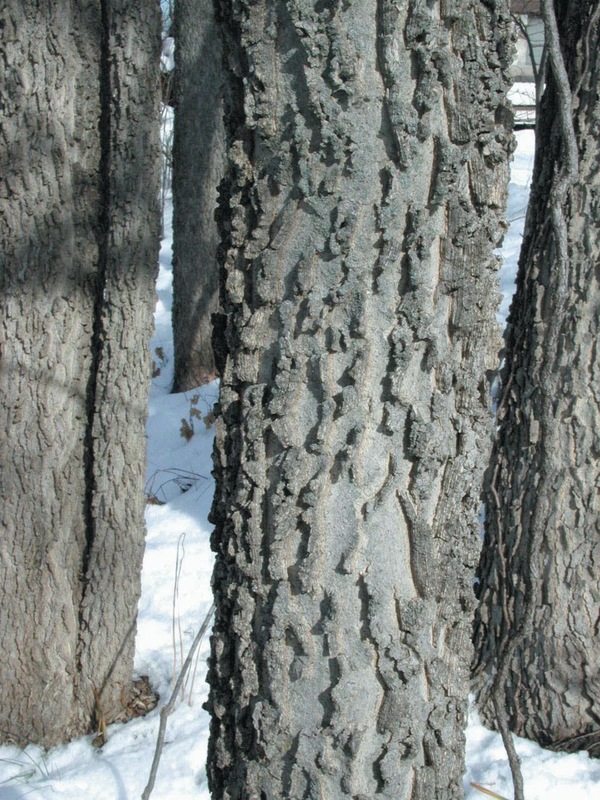 Spring, before the leaves come out, is a perfect time for cutting locust for posts because that’s when the bark peels off easily in long strips. The locust posts are for a new grape trellis. 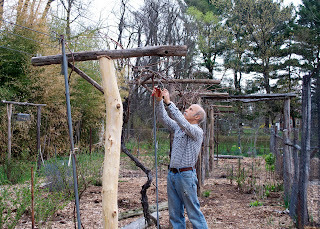 My grapes started out being trained to the traditional 4-arm Kniffen system, on two wires, one at 6 feet and the other at 3 feet from the ground. Two canes, originating near a central trunk, are trained horizontally in either direction along each wire to give a total of 4 canes each shortened to about 10 buds long. (A “cane” is a one-year-old stem. The 4-arm Kniffen system has its limitations in terms of exposing the vine to maximum light, which translates into better-tasting grapes, and keeping foliage and berries dry, which translates into less disease. So,a few years ago I morphed the vines to the high wire cordon system. A trunk about 6 feet high branched into two permanent arms (cordons) that travelled in opposite directions along a wire at trunk height. In this case, instead of being left with 4 long canes after pruning, the vine is left with many short canes drooping downwards right off the cordons. 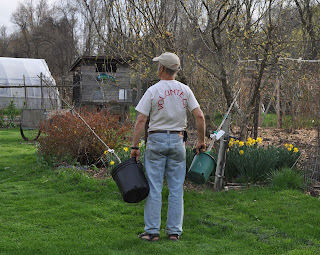 We bag some of grape bunches to foil the birds and the bees, as well as other pests. Bagging also lets fruits hang on the vine longer without damage and so develop sweetness and aromatics that make for finest flavor. The problem with the 4-arm Kniffen and high wire cordon systems of training are that the fruiting shoots droop downwards, which makes bagging difficult and puts the bags at an angle that defies gravity, not a good thing. Which is why my grapes have morphed again, this time to a 5-wire trellis system. 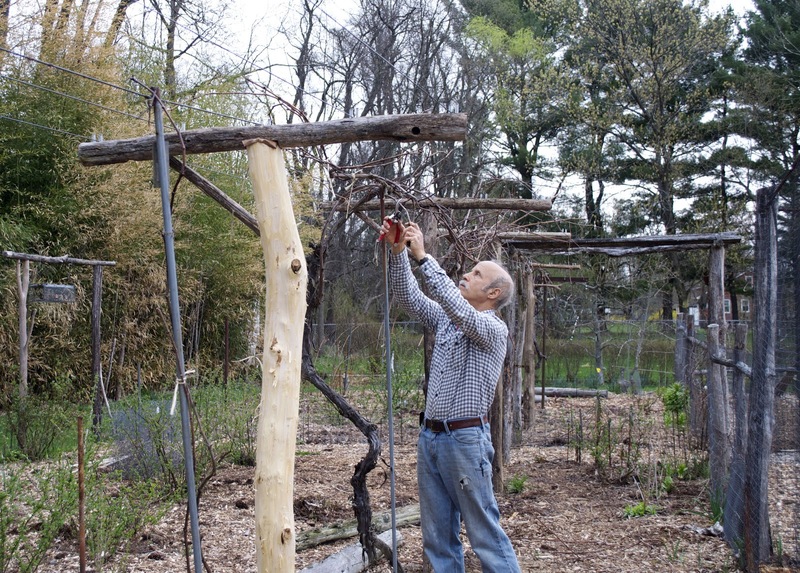 The latest incarnation of grape support consists, then, of sturdy T-trellises spaced 10 feet apart. Running perpendicularly to the cross-arms of the T are 5 wires, the middle one to support 2 cordons growing off horizontally in opposite directions atop each vine’s 7 foot high trunk. The other wires will support the fruiting shoots that grow from short canes along the cordon perpendicularly to the outrigging wires. The more horizontal growth of the fruiting shoots should make bagging easier. So it’s locust wood from my mini-grove that will deserve some thanks for luscious grapes. Not everyone is as enamored with black locust as I am. Many classify it as an invasive plant; here in New York, I’ve seen it classified as a native invasive plant. It originated in southeastern U.S. but now ranges far and wide because of its fecundity and it’s tolerance for a wide range of conditions below and above ground. The tree’s beauty and utility have also contributed to its spread, by humans. My only beef with black locust is with its thorns. Still, I like my black locusts and I like my grapes.